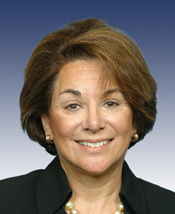 ESHOO, Anna Georges, a Representative from California; born in New Britain, Hartford County, Conn., December 13, 1942; A.A., Canada College, Redwood City, Calif., 1975; Democratic National Committeewoman from California, 1980-1992; chief of staff, speaker pro tempore of the California state assembly, 1981-1982; member of the San Mateo County, Calif., board of supervisors, 1983-1992, president, 1986; member, California Democratic state central executive committee; member of the Democratic National Commission on Presidential Nominations, 1982; unsuccessful candidate for election to the United States House of Representatives in 1988; elected as a Democrat to the One Hundred Third and to the thirteen succeeding Congresses (January 3, 1993-present). "Anna Georges Eshoo" in Women in Congress, 1917-2006. Prepared under the direction of the Committee on House Administration by the Office of History & Preservation, U. S. House of Representatives. Washington: Government Printing Office, 2006.